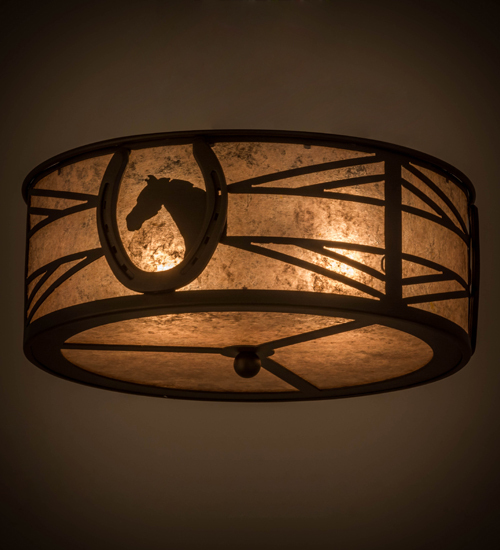 Description: A horse portrait framed with a lucky horseshoe encircles this handsome ceiling fixture. Beautiful ambient light projects through stunning Silver Mica accented by a geometric design styled after fencing commonly found at horse stables. Decorative hardware, frame and accents are enhanced in an Oil Rubbed Bronze finish. Perfect for game rooms, man caves and equestrian centers, as well as other residential and commercial spaces. Handcrafted by highly skilled artisans in the USA. Custom sizes, styles and colors are available. Energy efficient lamping options such as LED are offered. This fixture is UL and cUL listed for damp and dry locations.